RobertHuddleston served as a fighter pilot in the European Air War and writes frequently about that conflict. 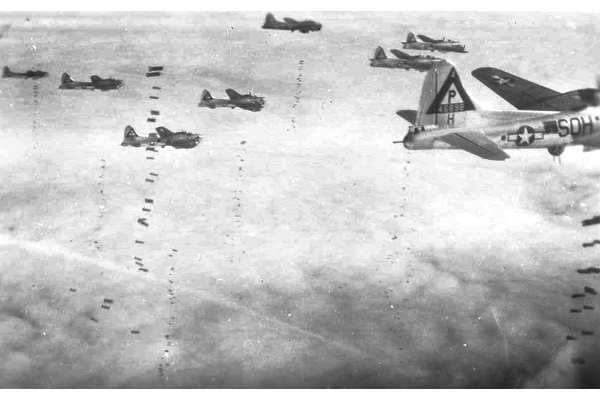 "B-17G formation on bomb run" by U.S. Air Force. Licensed under Public Domain via Commons. In a quick response, a New York Times editorial ridiculed his position pointing out that “carpet-bombing is a term used by amateurs . . . Indiscriminate bombing has never been a military strategy.” A military historian served as an expert source: “America has never carpet-bombed anyone at any time because that's not our doctrine,” declared Maj. Gen. Robert Scales, former commandant at the Army War College. Despite the utter devastation of enemy cities, American “Bomber Barons,” as they were called, insisted they were attacking military targets with “precision.” The British, however, were more honest: “The targets of the British campaign,” writes historian Donald L. Miller in Master of the Air, “ were the build-up areas of German cities, the residential centers where most of the workforce lived. . . The objective: to destroy 'the morale of the enemy civilian population and in particular, the industrial worker.' ” Be it a city bombed by the British RAF Bomber Command, or the American 8th Air Force Bomber Command, the results were similar: an utterly destroyed city with thousands of civilian causalities but limited impact on the enemy's military capability. (A distinction must be made between “strategic” air power and “tactical,” the latter being close air support of ground forces). Strategic bombing in the Second World War included heavy losses among the bombers and bombed and proved a failed doctrine. Heavy loss of civilian lives in what was, in reality, “carpet-bombing,” both in the European conflict and in the Pacific, never induced civilians to withdraw support from their leaders. And while the bombing of military targets did indeed aid in achieving victory, especially in attacking oil production facilities, it never produced an acute shortage of military equipment. In the last year of the European war, for example, German aircraft production actually increased though of limited value due to a shortage of fuel and trained pilots.